Itaconic Acid Market size was over USD 75 million in 2015, with expected gains at over 16.8% CAGR from 2016 to 2024. Growing concerns over shrinking fossil fuel resources, innovation & developments are being made to produce chemicals from biomass feedstock. 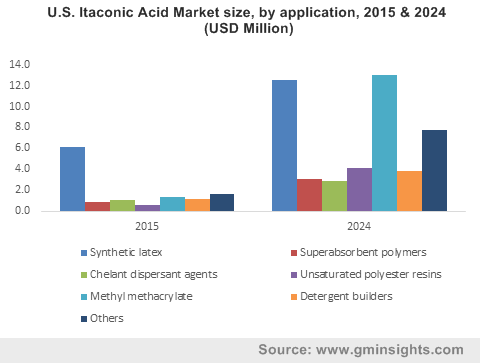 Readily biodegradability in soil and non-toxicity are key factor driving itaconic acid market growth. Strong application scope in methyl methacrylate (MMA) production in order to replace petrochemicals may fuel itaconic acid demand. Rising trends towards more environment sustainable products has encouraged the industry manufacturers to adopt biotechnological routes to produce Polymethyl methacrylate (PMMA). Global PMMA market is estimated to surpass USD 10 billion by 2024 which is likely to encourage industry growth. Mitsubishi Rayon and its subsidiary Lucite International are working on multiple approaches to produce bio-MMA. Lucite has already patented MMA production routes from Itaconic acid and plans to commercialize production and use by the end of 2016. However, there are multiple routes under development and are competitive. For instance, Evonik is also working on two processes which includes multi-catalytic process and metabolic routes. The industry is still at controversial stage which route will win the battle which is largely influenced by production cost. Price drop to make the production feasible and economical enough to replace acetone cyanohydrin in MMA will drive industry demand. Itaconic acid currently has a small market with limited industrial applications. This promising chemical compound blocks providing potential platform for coatings, polymers, biofuels, and other chemical compounds production. Unique properties such as high densities cell growth, robustness, stability, and easy to genetically are major influencing factors which may fuel product demand in several industrial applications including pharmaceuticals, light industry and agriculture. Superabsorbent polymers are recognized as potential segment owing to its ability to replace acrylic acid and to use polyitaconic acid through polymerization. Itaconix, the U.S. based company is focusing to adopt this biotechnological route. However, several companies including Arkema, Cargill, and Novozymes are working on bio-based acrylic acid which may affect the industry growth. Fluctuation in raw material supply such as sugar, glucose, and corn starch may impact itaconic acid market price trend. The addressable market relies on production cost for applications in which the chemical can be used as replacement. Other major chemicals which can be substituted includes sodium tripolyphosphate (in phosphate-free detergent builders’ production) and maleic anhydride (in UPR production). Synthetic latex accounted for over 50% of the global itaconic acid market size, mainly employed in synthetic latex for polymer stabilization and is used in order to improve the final product quality i.e. SBR latex. As per industry estimates, the application expects stagnant growth. However, significant change would occur if a novel product enters the market. Strong PMMA market growth forecast is likely to fuel itaconic acid demand in the production of MMA. The industry expects the segment to surpass USD 80 million valuation by 2024. The MMA demand is largely driven by new applications such as LCD screens, mobile phone screens, monitors, and video equipment. China remains to be great potential for the MMA. Unsaturated polyester resins (UPR) which is mainly consumed in marine, construction, and transportation industries is foreseen to be an attractive potential application. Itaconic acid is a potential green chemical to substitute maleic anhydride in UPR production owing to its similar structure and has potential to be a good substitute. China itaconic acid market size is projected to surpass USD 20 million valuation by 2024. APAC is the major producer as well as consumer for itaconic acid market and caters to over 50% of the global demand. Germany itaconic acid market size was 2.8 million in 2015. Favorable government norms to promote bio based production owing to environment safety may drive regional industry growth. EU regulations to stop sodium tripolyphosphate (STPP) based detergents production should drive industry growth in detergent agents. Personal care industry expansion accompanied by rising preference for bio-based products in South Africa, Saudi Arabia, and UAE may stimulate MEA demand. Global itaconic acid market share is moderately fragmented in nature owing to the presence of many domestic manufacturers in APAC. The industrial production is highly concentrated in China with major market players includes Zhejiang Guoguang Biochemistry, Qingdao Kehai Biochemistry, and Jinan Huaming Biochemistry. Innovations and development to target addressable market are key strategies. Itaconic acid, also referred as methylene succinic acid, is a chemical intermediate. It is a five carbon molecule which is similar by maleic anhydride structure. The chemical was listed in 2004 by the U.S. Department of Energy as the top 12 top value added chemicals. The foremost route to obtain itaconic acid was through citric acid distillation. Later from 1960s, this chemical being produced industrially through carbohydrate fermentation such as glucose using Aspergillus terreus. Currently, the intermediate is produced through sugars with molds fermentation. It is a significant raw material in the chemicals industry. It is a white crystalline powder which can be soluble in ethanol, water, and acetone with having application in products as surface active agents, lubricant additives, plastics, dye intermediates, chemical fibers synthetic rubber and resins. The current market is very limited and small to few applications owing to its high cost fermentation process. The base technology for the itaconic acid fermentation is commercialized and research efforts for an efficient and low cost methods for the itaconic acid production and its derivatives are still under investigation.